Sport can be used as a powerful tool to promote peace, tolerance and understanding by bringing people together across boundaries, cultures and religions. It can be used as an instrument to rebuild trust in communities that have been torn apart by conflict. Bentiu, South Sudan: As soon as I blow the starting whistle, 12 women crash into me, one after the other, hitting as hard has any man ever could. When the stampede passes I see 50 women tearing off into the distance down the back road of the Bentiu protection of civilians (POC) camp in Unity State, South Sudan. 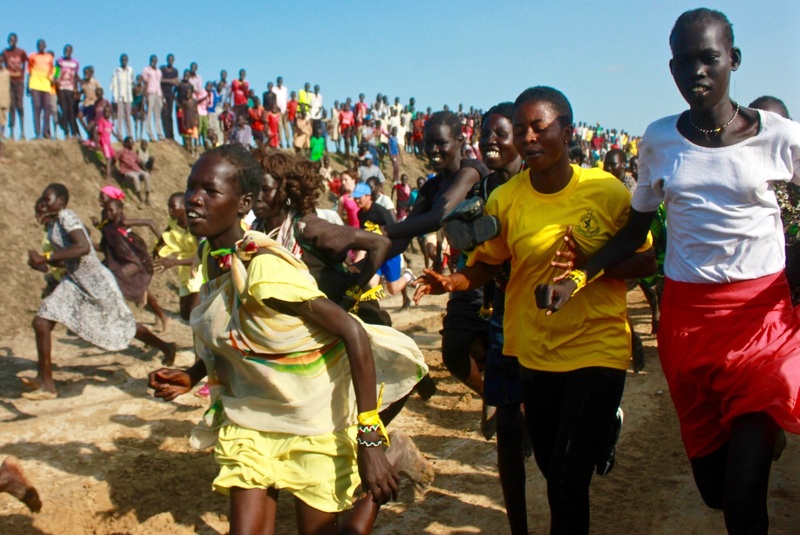 Instead of running for their lives, these women were running free in the inaugural Bentiu community fun run. The race was the first major sporting event to be held in the camp and saw participation from the Peacekeeping forces, the community of internally displaced persons (IDPs), humanitarian workers, UN Police and civilian staff of the United Nations Mission in the Republic of South Sudan. The Bentiu POC site is the largest in South Sudan and home to approximately 110,000 people seeking protection from the brutal civil war that has torn the youngest country in the world apart. For a community that has suffered so much hardship over the last few years, the race was a chance to forget, even if for just a few hours, and have some healthy fun. In front of a crowd of 40,000 people, 50 women and 70 men raced along the 4km road around the UN camp. As the female competitors walked to the starting line, one woman broke out into song and everyone began cheering in response. IDPs, peacekeepers, police and humanitarians were all singing together as a symbol of unity. The women's race was won by a young South Sudanese woman wearing a loose flowing dress and no shoes. As she crossed the finish line she was carried high in the air by a nearby crowd - she was a hero to her people. For one brief moment she was no longer an IDP, but a champion athlete and the pride of her community. The men's race was won by a Ghanaian soldier, with two IDPs coming in second and third. Most IDPs ran with no shoes, making their achievements all the more impressive. Sport can be used as a powerful tool to promote peace, tolerance and understanding by bringing people together across boundaries, cultures and religions. It highlights values such as teamwork, discipline, respect for the opponent and the rules of the game, solidarity, social cohesion and peaceful coexistence. Sports can be used as an instrument to rebuild trust in communities that have been torn apart by conflict and are experiencing the post-traumatic effects of conflict. As I run around the camp now, women come and run next to me for a few hundred meters laughing and smiling. They have been inspired by those 50 women who ran the race, and I look forward to a future when they can run free once again.